It’s June and that means celebration time!! Time to celebrate everything great!! Cub Scouts get to pick a reason to celebrate – maybe Happy Sunshine Day or My Best Pal Day or even Hurray for Ice Cream Day!! June includes Hug Your Cat Day, World Juggling Day, and Happy Birthday to You Day. Take your calendar and fill in the blanks – make every day a holiday. Whatever the reason or season, it’s fun to share the joy. Personal Achievement, Your Cub Scouts will feel the joy as their invitations turn into fun for the whole den. Friendly Service, Invite everyone to be part of your everyday celebrations. Fun and Adventure, What’s more fun than a celebration? Cub Scouts will develop new observances and have fun while learning. Respect, Cub Scouts will realize that everyday has worth and value. It was another interesting theme to be pouring through Pow Wow Books for ideas. Almost everyone had a calendar of special days in June but the material varied widely. One book was all standard summer stuff no holiday mentions. A very good approach in one council’s book was a note relating each (well almost all) item to one of the June holidays. And others were somewhere in between. It might be great to emphasize Flag day, June 14, but be careful, July has a patriotic theme, “Red, White and Baloo,” for Fourth of July. Or maybe because this is summer, you want to make one theme go for two months – tie Flag Day in with Fourth of July and keep everything patriotic and FUN!! Some of Baloo is oriented to various days in June, some is just good stuff I found and thought you would enjoy. The best bet – look at your Program helps and Resource Page (from Roundtable). Pick a few special days and bring them to life for fun or seriousness for your Cubs. What's a holiday? Festival? Celebration? A consecrated day; religious anniversary; a day set apart in honor of some person, or in commemoration of some event. (Law) A day fixed by law for suspension of business; a legal holiday. An occasion for feasting or celebration, especially a day or time of religious significance that recurs at regular intervals. An often regularly recurring program of cultural performances, exhibitions, or competitions: a film festival. National makes a patch for every Cub Scout Monthly theme. This is the one for this theme. Check them out at www.scoutstuff.org go to patches and look for 2006 Cub Scout Monthly Theme Emblems. The 2005 Theme patches are still available at about one-third off!!! Check your calendar for a variety of holidays we don't normally celebrate. Did you know that every day in June is a holiday? June 15th is Smile Power Day, the 29th is Camera Day, the 10th is National Yo-Yo Day, and the 20th is Ice Cream Soda Day. Not only is June 14th Flag Day, but it is also Pop Goes the Weasel Day. You can celebrate a June holiday or create your own. Invent a new sandwich for Sandwich Day. June is National Accordion Awareness Month as well as Zoo and Aquarium Month. If you can't find a holiday for your den, you can invent your own and celebrate it at the pack meeting. Radio Was Patented In 1896. First U.S. Spacewalk by Ed White in 1965. First Ford Made Henry Ford made his first operational car in 1896. First Hot Air Balloon Flight by the Montgolfier brothers in 1783. Frank Lloyd Wright's Birthday in 1867. Movie “E.T.” premiered in 1982. Anne Frank born in 1929 in Frankfurt am Main, Germany. The baseball was invented in 1839. Sand Paper Invented by I. Fischer Jr. in 1834. Garfield debuted on this his birthday in 1978. 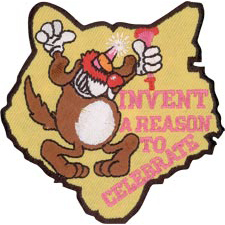 Tasmanian Devil debuted on this his birthday in 1954. Melody for Happy Birthday Song written in 1859.
http://www.web-holidays.com/calendar/june/ - This web site has many, many more holidays that I did not list. So if you want a few more, go there! It turns out the authority in this area is “Chase’s Calendar of Events.” This is a book and CD published by McGraw-Hill to which I did not have access. I have been told the UPS calendar is fantastic with national and international holidays. Dave’s spreadsheet classifies this theme as Festivals. These are the other months with themes listed as Festivals. None seem as diverse as this month’s vignette’s ideas forInvent a Reason to Celebrate.